U.S. stocks were mixed on Wednesday, Dec. 6. But the tech sector posted a rebound after recent selloffs. The Dow Jones Industrial Average declined 0.16% with the broader S&P 500 dropping by 0.01%. Telecom giant AT&T Inc. (T - Get Report) fell 1.2% and Verizon Communications Inc. (VZ - Get Report) declined 0.5%. The Nasdaq rose 0.21% as many tech shares advanced. Shares of Facebook Inc (FB - Get Report) rose 1.8%, Google parent Alphabet Inc. (GOOGL - Get Report) gained 1.3%, Microsoft Corp. (MSFT - Get Report) advanced 1.4% and Netflix Inc. (NFLX - Get Report) rose 0.6%. Facebook, Alphabet and Microsoft are holdings in Jim Cramer's Action Alerts PLUS Charitable Trust Portfolio. Want to be alerted before Cramer buys or sells the FB, GOOGL or MSFT? Learn more now. Oil prices in the U.S. were down 2.9% after the Energy Information Administration said crude-oil inventories fell 5.6 million barrels in the last week, more than analysts expected. Stocks in the energy sector were lower. Exxon Mobil Corp. (XOM - Get Report) and Chevron Corp. (CVX - Get Report) each fell less than 1%. 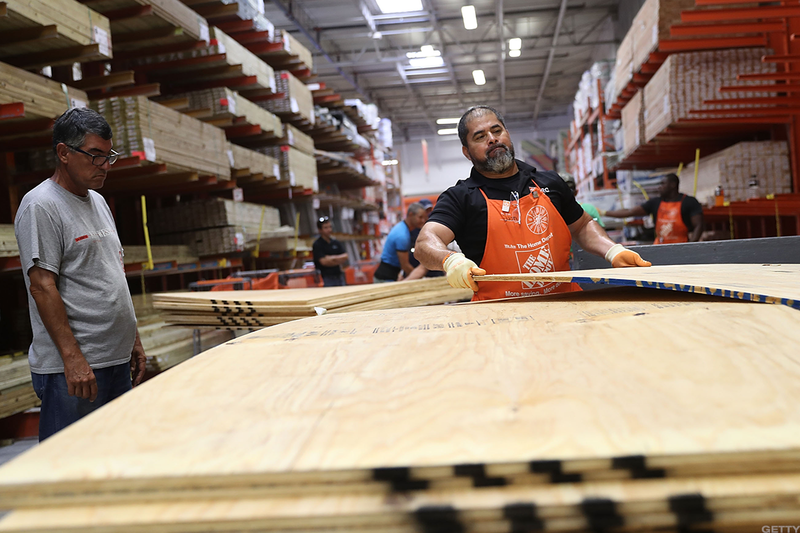 Home Depot Inc. (HD - Get Report) shares fell 1% even as the home-improvement retailer reaffirmed its full-year sales and earnings guidance ahead of an investor day conference call from its Atlanta headquarters and outlined a $15 billion share buyback plan. Dave & Busters Entertainment Inc. (PLAY - Get Report) declined slightly even after the company smashed Wall Street's estimates for its third-quarter earnings and said it will open more stores this year. Investors were also focused on another major announcement in the healthcare sector, which saw UnitedHealth Group Inc.'s (UNH - Get Report) Optum combined DaVita Inc's (DVA - Get Report) medical unit in a $4.9 billion deal. DaVita shares gained 13%, while UnitedHealth Group shares slipped 0.04%. Shares of Square Inc. (SQ - Get Report) were down 0.05% after the company announced its Cash App would allow more users to buy and sell bitcoin. U.S. 2-year note yields rose to a nine-year high of 1.82% overnight before paring that move to 1.81% even as 10-year yields rallied to 2.32%, putting the difference between the two values at just 52 basis points, leading investors to worry if so-called "curve inversion," in which short term rates rise higher than longer-term ones, was taking place. The condition sometimes forecasts recession. Investors got an early indication on the U.S. jobs report for November from ADP's private sector jobs reading on Wednesday, which showed a modestly better-than-expected 190,000 Americans found work last month, down from 235,000 in October, largely in education and health services and manufacturing.